Very cool bike. I picked up the 2012 model (Australia) and since it's hard to get any information about this bike since it's so new, here's a review of what I've discovered so far in the first few thousand km. At the end, I've added some comments a year later after the bike has travelled 5000km and reflecting on the changes to the 2013/14 line-up. Price: RRP is AU$1199 but you might expect to get it for 10% off that for cash up front if you get interested early, before this bike becomes sold out like previous Giant neo-classics. I bought mine at Yarra Valley Cycles in Lilydale, Victoria, Australia. These guys are a classic example of a good, busy local bike shop and as they specialise in Giant, they were as keen to find out about this bike as I was! A lot of my mates have spent 2k to 3500 thousand on a bike and it's great to find that you can also get a really neat bike for a lot less than that. SLX Shadow gears for this price? Yes please! Why this bike? I like to go out two or three times a week for a ride along part or all of the 40km Warburton-Lilydale rail trail (and back), which is a beautiful track that goes past my house made of mostly hard-packed gravel. So I need something fairly light and fast that can cope with some bumpy tracks, occasional pot-hole, tree branch and maybe a bit of a bash along a forest trail. Oh, and be able to outrun crazy aggressive Aussie magpies (birds!) when they swoop in for the attack. Basically, an SUV car-styled bike...but not a bloated one. I find mountain bikes too slow for my riding unless they are going downhill. Hybrids like the Cypress are good in theory but seem pretty dull in reality. Road bikes can't cope with fire-trails and rail-trails very well; they get very twitchy and are somewhat fragile and also there is so little room around the back wheel that they they get clogged up. I did love the Giant Seek cross-city type bike and that could cope with gravel alright I suppose with wider tyres, but the Roam appears designed to perfectly fit the 'sporty-go-faster-but-can-do-some-rough-stuff' category. Right now, it is quite cool as no-one really knows what it is and assume it's a 29-er mountainbike that I've put slicker tyres onto. How does it go? It's great to ride and flies along. It's comfortable too. I use a GPS to see how things look: 25ish KMpH is pretty easy on flat-gravel over 2 hours' run and taking things rather easy in neutral weather conditions, I've been able to cruise at about 22KMpH without any effort at all and I mean, NO effort. With 30 gears (but really you use only a few of these) selectable from a rapid-fire select system of gears, you can cruise at speed with ease and also tackle some very steep gradients if needed (on smooth surfaces). It stops fast enough to scare you at first: the hydrallic disc brakes are just stunning and are getting even better as they bed in. You can do front wheel stoppies incredibly easily like on my old TZR250 motorbike! Obviously an 8 kilogram road-bike etc will be way faster, whereas on the other hand a true MTB will be a lot tougher and open up single track riding as well. But then, that's why this is a hybrid. Other Roams: I got the Roam W (Women's Roam 4) for my daughter and it's very good, coming in at $549 retail; it is really a different bike since all the components are different. The Roam XR3 looks like a good bike, but there is a big jump in the quality of the parts with the XR1 so this was definitely the best value one, with hydraulic brakes, lock-out front forks (so that you can make them non-bouncy to save energy on flat rides) and SLX 10 speed rear gears, giving 30 gears overall. The XR2 shares some of these characteristics but has a lower-spec in some areas and in particular the gears all-round are a model down. Still a nice bike but for $199 more before any discounts you can secure, I think most will be glad to get the XR1 which is the top of the range in Australia at the time of writing. Plus, it is Black! The 2013 models changed the colours, specs and names somewhat, as I've described at the end of this piece. The 2014 models radically changed the parts mix and basically lost the plot. 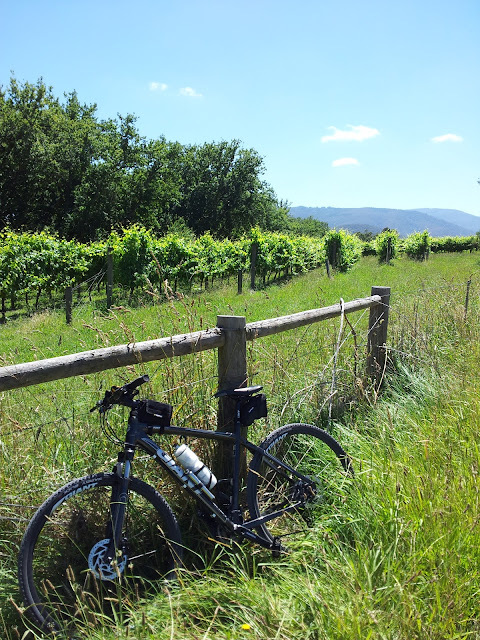 Main use: Undulating gravel trails; two-day touring rides. It has lugs fitted to carry a rack so some touring will be a lot easier. Other Notes: You'll probably want different pedals: the stock ones are pretty feeble. At first I used Shimano A530 SPD pedals. They have normal pedals on one side for any old shoes and SPD mounts on the other for cycling shoes. 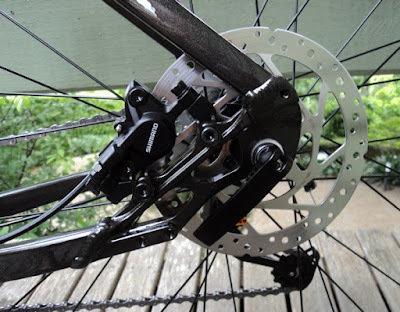 They also come in black which matches the cranks nicely. However, I found these slippery and fussy after a while and changed to the basic M520 Shimano SPD pedals which are cheaper and better. I use them with Shimano MT42 SPD shoes, which look like light hiking shoes and also let you clip into the mechanism on the other side if you want to. *Saddle: pretty narrow so choose your saddle bag carefully if you use one. The Topeak Aero Wedge Medium fits perfectly (but the Large size rubs your thighs) as it has a narrow profile and a plastic mount to keep the bag angled out from the seatpost. It's micro-adjustable Giant brand and is a good unit. Having said that, I put a Selle Itallia C2 on instead but there'd be no real need as the Giant one is good. *The Roam has lugs for two bottle cages and you can just about cram two bottles in. *Front gears are Deore XT (trekking edition); rear gears and shifters are Shimano SLX (shadow edition); these are good upper-mid-spec mountainbike units and they shift very nicely! Looking at comparable bikes, you will really struggle to find an SLX set on a $1199 bike, other than Giant. Check the Scott Sportsters or Specialized Sirrus for comparisons. *Removables: A personal choice this but I like the minimalist look, so I ditched the spoke and front/rear reflectors. I cut off the rear-sprocket spoke guard as when gears are adjusted right, you never need these and they are just another thing to clog up with grime. *Brakes: a real highlight, are Shimano's basic hydraulic models but these are REALLY good. I did replace them with much higher-spec SLX ones actually, since I happened to get a set very cheaply, but I really do have a lot of praise for these Shimano M445 hydraulic ones. I now have a bike with top-spec XTR brakes and I still think that the sturdy little ones fitted to the Roam do a great job. Giant decided to just sell the bike with its own brand of tyres from 2013. Possible problems: 1) Remember that the front fork is for recreational riding not heavy off-roading. It's weaker than a keen mountain bike rider will use. If I want to do more off-track stuff on the Roam I'll swap this for a stronger one and change tyres. Another idea would be to just equip a lighter unsprung set. 2) The handlebars are 620mm wide, which is not that long for mountainbike bars, but I still cut mine down by 4cm for better trail-orientated riding as bars wider than my shoulders, whilst good for control, cause aches in my arms. I am also getting a set of Ergon GR2-L Twist Shift Composite Race Grips to give more hand positions too on longer straighter sections of riding, which is much of what I do. 3) Within 100 km I noticed signs of 'Bike Cable Rub' around the headtube, see this website for solutions to this really common problem with lots of today's bikes: http://cycleseven.org/bicycle-cable-rub#comment-7939 I never had this issue with the bikes I used to ride as a teenager; looks like a problem looking for a solution from manufacturers. Giant Roam XR1 Weight: Giant never states this, but the out-of the box the weight with no after-market accessories was 12.5 KG as measured in the shop. Pretty good for the price. Giant split the range into three. The women's bikes were called ROVE instead of ROAM. The men's bikes come as a basic spec called just ROAM and an upgraded spec called ROAM XR. Even sillier and more confusing, women's bikes are just being LIV branded instead of GIANT. Within each category there are better models as before. As far as this review goes, there is a men's Roam XR2 and a Roam XR1 as before. 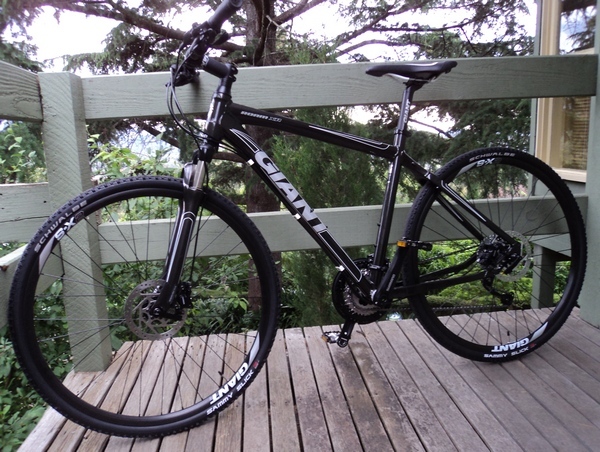 The 2013 Roam XR1 is very similar to my one as reviewed. The Giant own-brand tyres may be a downgrade and the rear gears are certainly a slight downgrade, being one set lower in the Shimano range as they are now LX rather than the better SLX Shadow. On the other hand, there is a handlebar remote lock-out for the front forks now to save you leaning down to lock the front forks, yet this will rarely be used and is fairly pointless. The biggest change is arguably cosmetic as the new model is grey and white and yellow. Together with the new 2014 Anyroad, these cross-bikes seem to have devolved into an odd mix of cheaper sub-name spec Shimano, Giant, Avid and SRAM parts and I would no longer be buying the bike with these sets of components. What they should do is just sell a Giant Roam XR0 with a full SLX set, composite forks, and be done with it. For this reason, the earlier bike remains a better buy. ...goes through deep grass and vinyards..! I have had my same model roam as above for 4 years. Only just replaced the bottom bracket and chain. Done around 4k kms. Really love this bike for general riding. I notice the newer revolt has the same frame design in the rear. Newer roams where different. Pity they now down spec the newer models. 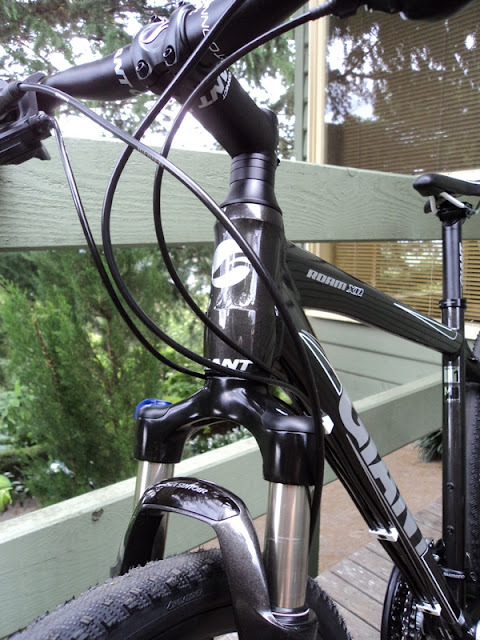 Want a new front fork for your roam. Look up the Rockshox paragon. Made for hybrids. Was just think I should replace my bottom bracket today while cleaning the chain... What did get as a replacement BB? BB52 think. Under $25 from wiggle. Educator, Adventurer, Writer and Technologist based in Melbourne, Australia.